Last week, Delhi saw the birth of something quite special. Initiated by the Gati Forum, the Ignite! 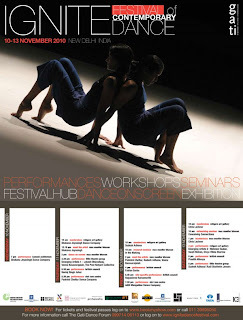 Festival of Contemporary Dance in India, provided a new space for creativity in the field of Indian contemporary dance, as Anusha Lall (a dear dear friend), director and founder of Gati said. I had the privilege of working for the festival, primarily as the Company Assistant for the Shobana Jeyasingh Dance Company from the UK, but also as a volunteer for the festival on the whole. The experiences was exhausting and enriching at the same time, but as I rest out the exhaustion, the enrichment will stay with me for a long time. As a volunteer, in the midst of running around, being at someone of the other's beck and call even at 11pm at night or 7am in the morning, one could squeeze in the time to watch performances, talk to the performers, meet with informed and uninformed audiences, interact with other young dancers and much more. It has been quite an experience. Apart from the one day that I was performing myself at the Attic (an avoidable clash of dates that completely slipped my mind), I was there everyday, watching and absorbing everything that I could. Below are some of my thoughts and observations about the festival and the performances I watched. I managed to watch four dance performances properly. The first was the Shobana Jeyasingh Dance Company from the UK. I was instantly struck by the physical agility and flexibility of the dancers. Their double-bill 'Faultline' and 'Bruiseblood' had immense potential, although sometimes the pieces didn't speak to me, I later thought. But I think I went into Kamani Auditorium with the intention of seeing something in partiucular - and that intention was satisfied. 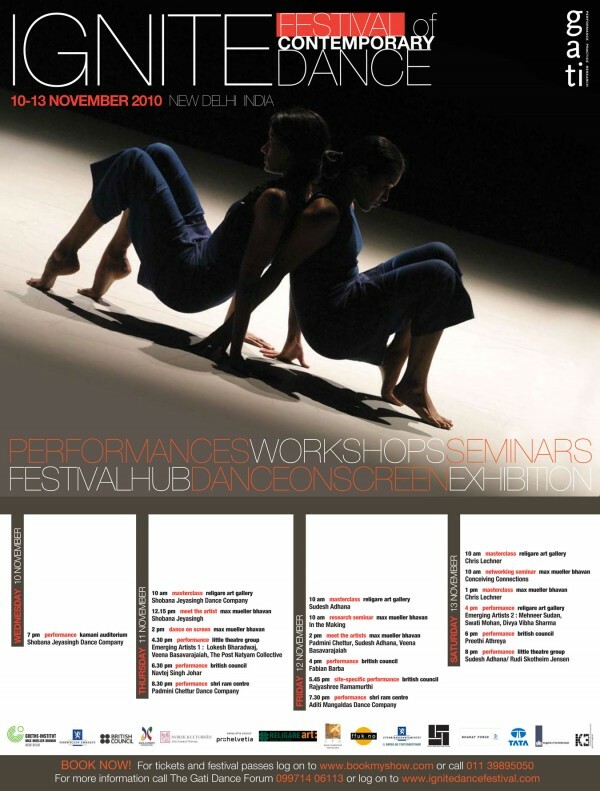 I wanted to see, specially, how organically Bharatanatyam and western contemporary dance were melded together. This worked for me. I have been searching for an organic fusion of this for a while, since many choreographers today seem to be experimenting with the two styles. I found it here. The movements were organic and crisp, and one could tell that Shobana had been working on this style of dancing for two decades. I did feel at some point that there was very little that was Indian about this contemporary dance performance. The 'Meet the Artist' session the next day helped to understand more. It also made me think that as spectators, we must learn to be less judgemental at first glance and try and understand the choreographers intentions, limitations and strengths before we jump to criticise (something I find young inexeperienced dancers in India doing more and more). Shobana explained that she worked with whatever she got. Her choreography of the same pieces would've been completely different had she worked with dancers who had a stronger background in Bharatanatyam, than in Ballet or contemporary dance. "I work with what I get", she said. Fair enough. Mehneer Sudan, a young choreographer affiliated with Gati was the next performance I saw which I hadn't seen before. I was moved. Her piece 'Closure' was emotionally charged, heartfelt and genuine. With enough but not too much emphasis on technique, she managed to express something to me through her face as well. I have been told that one of the big differences between Bharatanatyam and contemporary dance is that in classical indian dance, we use the face to express, but in contemporary dance - its the body. Many a contemporary dance performance display stone-cold expressionless faces, perhaps as a way to emphasize their expression through bodily movement. Mehneer did both. Her face and body expressed a lot. I really enjoyed it, and hope to see more of Mehneer's work. Running around between Religare Art Gallery, and Max Mueller Bhavan, I managed to reach Preethi's performance slightly late. Preethi, Anusha and I went on Leela Samson's troupe 'Spanda''s tour in 2002 to China and Japan in 2002. As a sixteen year old, I was only just being exposed to contemporary dance and knew nothing of Preethi's work at the time. The little of the performance that I saw, I found quite interesting. What I really liked about it was the play with speed during her speech section. Even otherwise, her floorwork was 'messy' in a very controlled and beautiful way. By 'messy', I mean there was no balletic technique there, she was just feeling through the movement. I think so, anyway. Another performance I enjoyed. Sudesh Adhana concluded the four day festival with his performance with a Norwegian dancer. They used acrobatics, circus moves and dance to create quite a funny piece. Their use of props was very interesting, and they had a lot of them. In the beginning, I did wonder what their piece was really trying to say, though. Witty and funny as it was, the piece suddenly took you into the depths of hell when the Norwegian dancer tells the story of how he bumped into a girl at the train station who fell onto the tracks. He "wanted to help her"...and the auditorium is engulfed by the deafening sound of a train engine whizzing past. Eerie. On the whole, I really liked the rawness of the piece. 1. The Sangeet Natak Akademi and ICCR are loaded with money, said one panelist who is on a committee of both organisations - so why are the arts so underfunded in India? Where is that money going?? 2. ICCR is being pushed to send only film-based choreographers overseas to showcase Indian culture - who has initiated this and why is this not being opposed to? 3. 735 crores are set aside by the Ministry of Culture annually for the promotion of Indian culture. Of that, 150 crores is surrendered because they feel there are no 'imaginative plans' - who defines what is imaginative? And what is happening to the remaining 580 crores? 4. Finally, Delhi is choc-a-block FULL of some of India's most well-known classical dancers - where WERE they? We didn't see them at this festival! Are we really a network that wants to support one another? Or are we getting trapped in this increasingly accepted binary between classical and contemporary? Watch out for an article about the battle between the classical and the contemporary on this page soon. I do not ever see my choreographic process as a fusion between western Contemporary dance ( whatever that is!) and BN. Contemporary dance does not have a permanent code that one can fuse/blend/mix with anything else. It is only an attitude to creation which allows the personal in both movement generation and movement composition. This obviously creates its own conventions and etiquette and a familiarity with these will greatly enhance a more fulfilling spectating experience. As you rightly point out if one's definition of all fruit comes from a banana then tomatoes are bound be unsatisfactory! Re Indian ness ( or lack of) i am not sure why nationalist and racial discourse have to play a role in dance analysis. You wore jeans and spoke English. You chose how much of the rhetoric of Indian ness you wished to display - I took the same liberty in my dance making! contemporary dance is no different from post historic contemporary living. Hi Shobana! Thanks for your comment. It is words and their multiple interpretations that always get me in trouble. I increasingly realize that I need to be more careful about this in my writing. I did not mean 'fusion' in the sense that this word is increasingly coming to be known in the world of arts. Music fusion somehow implies that a tabla is used in the same band as an electric guitar, and perhaps dance fusion is said to mean a jarring mix between two different dance forms - i know they have negative and derogatory connotations. I merely meant you interconnected two dance forms organically. As far as contemporary dance not having a permanent code - Again, I have thought about this before, specially when I tell people that I have trained in contemporary dance. I'm not quite sure what they understand precisely because of what you say. And also because I have seen so many different kinds of contemporary dance, that I agree that it does not have one generic definition. I say 'western contemporary dance' here as an accesible way of describing the non-Bharatanatyam aspects of your work which were contemporary and not rooted in India, but rather came from your interactions with dancers trained in western styles of dance - You mentioned that flamenco, ballet and other dance forms are used in your work sometimes, depending on what the dancers are trained in. Secondly, I agree with you completely about your point about indian-ness. My admission that I felt there was nothing Indian about the dance for a brief moment was an admission that I had made a hasty judgment. This is why I went on to then explain why the discussion the next day helped to dispel that kind of analysis. Thanks for your considered reply. Re your label for everything that is not BN in my work could I make a few comments with a lot of respect for your enquiring and stimulating mind? All the movement in my work is invented in the studio. They may be influenced by the dancers' own history but I dont "use" ballet or flamenco. Russia and the arabs probably played a huge part in these two dances anyway, I do not essentially see these as examples of western dance but a store house of the body's memory.My main concern is looking to put the body in extremis specially in relation to space. I look to make the body multi coded. My BN influence is in the use of weight and in the use of precise detail probably. It is like the foundation of a building that is invisible but vital or like the subconscious in creative activity.. I think because Bharatha Natyam's roots are much embedded in the Renaissance of nationhood in the colonial struggle in the early part of the 20th century the conflating of nation and dance seems to have become a permanent feature of dance discourse. A result of this could be the never ending and overly polarised debate of Contemporary versus classical. All the best for your continuing journey into dance the and the analysis of it. Hi Shobana, thanks for that! The most recent debate in my mind due to some of the comments on my latest blogpost is whether or not we should 'talk' about dance, are 'meet the artiste' sessions useful or do they destroy the experience of watching a performance? And finally - what does academics have to do with art? They are three big concerns in their own right, but are sort of connected. What do you think? I've found talking to you about your work quite englightening, and I feel I am the better for it. It's also been a learning experience. Why do you think there is such resistance to talking about dance? And where does this idea come from that academics has nothing to do with art? ?